Having a new baby in the home can be a little overwhelming at times, especially for first time parents. If you are formula feeding, you may not realize that consistent miscounting of scoops, overfeeding or underfeeding your baby on a regular basis can have long-term health implications. So what's a busy mom to do when you're holding a crying, hungry baby and are trying desperately to accurately measure your child's formula into their bottle? Thankfully Compac Industries has developed the fool-proof way to formula feed your baby so as to maximize their health and nutrition. 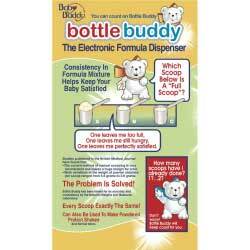 The Bottle Buddy is a unique electronic formula dispensing product which accurately measures a pre-set amount of infant formula, mixed into a baby's bottle. Keep reading to learn more! 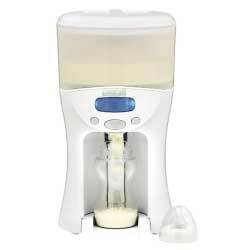 I reviewed the Bottle Buddy Electronic Formula Dispenser from Compac Industries, Inc., which retails for $89.99. 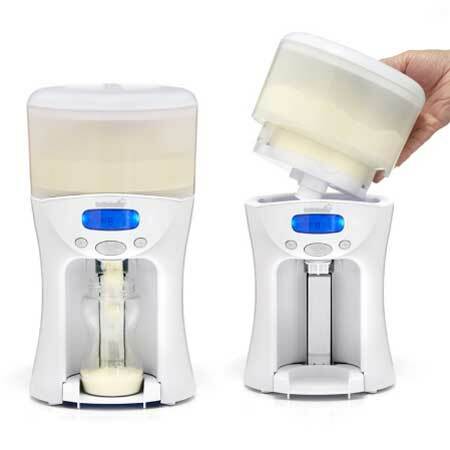 Using Bottle Buddy, the electronic formula dispenser, to make up a feeding is convenient, quick and easy to use and, most importantly, it saves time and ensures that every bottle contains the right amount of formula. It's a common, yet annoying, mistake to make: you're preparing a bottle for your baby and counting the amount of powder into the bottle when someone or something interrupts you. Before you know it, you’re wondering: "was that five or six scoops?" and have to start over again. Bottle Buddy eliminates the risk of contamination, human error and spillage by delivering an adjustable, preset, consistent quantity of powder at the touch of a button. 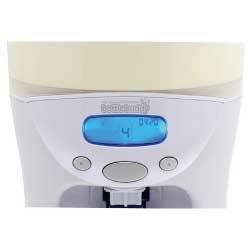 Bottle Buddy is ideal for new parents or caretakers who may be nervous about formula quantities. Bottle Buddy is set to revolutionize the way parents make up their babies' bottles forever. Breast milk is generally thought to be best for babies but there are a number of good reasons why many mothers choose to bottle feed from birth or only breast feed for a short while. Some parents supplement breast milk with powdered infant or follow-on formula - especially as the baby gets older. Whatever they choose, all parents want to see their baby thrive and grow at a healthy rate. On average, parents put over 10,000 scoops of infant or follow-on formula into bottles in the first year of a baby’s life. It is not only very time consuming but also very easy to miscount the amount of formula used, especially when holding a crying, hungry baby and trying to make up a bottle at the same time. Using Bottle Buddy to make up a feeding ensures that every bottle contains the correct amount of formula and overcomes some of the serious health risks associated with formula feeding. The current method of manual scooping is very inconsistent and leaves a huge margin for error. Wide variations in the weight of powder obtained per scoop ranged from 5.6 grams to 2.8 grams. Now multiply that margin of error by the number of scoops you put into each bottle of formula and you see why the Bottle Buddy is essential to the health of your child. 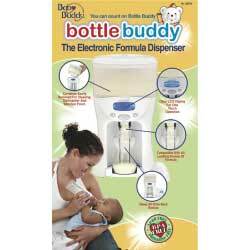 I think the Bottle Buddy Electronic Formula Dispenser is an idea that is long overdue for us busy moms and families out there. Eliminating the human error factor when preparing baby's bottles is huge in maintaining their health, which in the end, is what we are all striving for: healthy, happy kids! If you have a busy mom on your holiday gift list this year, then by all means, lend a helping hand with the Bottle Buddy! Disclosure: I received the Bottle Buddy Electronic Formula Dispenser from Compac Industries Inc. in order to facilitate my review. No other compensation was received. This product review is based on my own personal experiences with this item and is completely honest and objective.